Civilian Work Force | What Planet Is This? The plot shown here uses data from the U.S. Department of Labor Statistics. 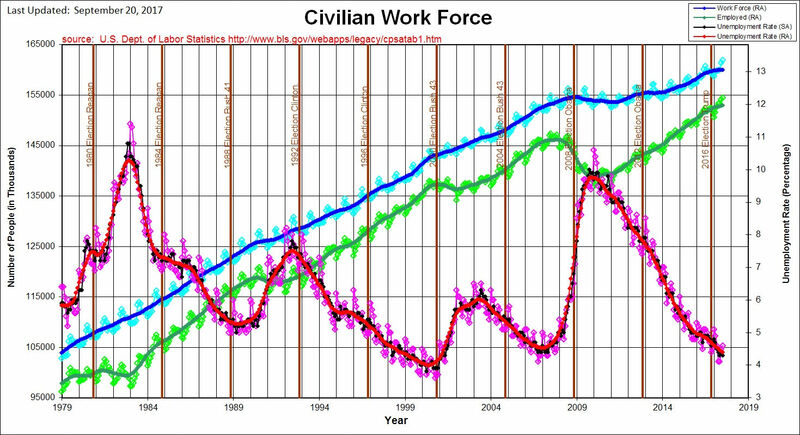 The light blue dots are total civilian labor force, the light green dots are total civilian employed, and the pink dots are the total civilian unemployment rate. The black dots are the seasonally adjusted total civilian unemployment rate. The blue, green, and red lines are 12-month running means of the monthly values (the end-points are a problem–of course). A 12-month running mean seems to do a better job of filtering out the month-to-month and season-to-season fluctuations and shows the overall trends better. The vertical brown lines delineate the November elections of each President within the scope of the graph. Unemployment rate is a lagging economic indicator.